2001-02-07 Assigned to HEALTH AND HUMAN SERVICES, THE GOVERNMENT OF THE UNITED STATES OF AMERICA AS REPRESENTED BY THE SECRETARY OF THE DEPARTMENT OF reassignment HEALTH AND HUMAN SERVICES, THE GOVERNMENT OF THE UNITED STATES OF AMERICA AS REPRESENTED BY THE SECRETARY OF THE DEPARTMENT OF ASSIGNMENT OF ASSIGNORS INTEREST (SEE DOCUMENT FOR DETAILS). Assignors: AXELROD, JULIUS, GRIMALDI, MAURIZIO, HAMPSON, AIDAN J. 2015-05-28 First worldwide family litigation filed litigation Critical https://patents.darts-ip.com/?family=26767641&utm_source=google_patent&utm_medium=platform_link&utm_campaign=public_patent_search&patent=US6630507(B1) "Global patent litigation dataset” by Darts-ip is licensed under a Creative Commons Attribution 4.0 International License. Permanent injury to the central nervous system (CNS) occurs in a variety of medical conditions, and has been the subject of intense scientific scrutiny in recent years. It is known that the brain has high metabolic requirements, and that it can suffer permanent neurologic damage if deprived of sufficient oxygen (hypoxia) for even a few minutes. In the absence of oxygen (anoxia), mitochondrial production of ATP cannot meet the metabolic requirements of the brain, and tissue damage occurs. This process is exacerbated by neuronal release of the neurotransmitter glutamate, which stimulates NMDA (N-methyl-D-aspartate), AMPA (α-amino-3-hydroxy-5-methyl-4-isoxazole propionate) and kainate receptors. Activation of these receptors initiates calcium influx into the neurons, and production of reactive oxygen species, which are potent toxins that damage important cellular structures such as membranes, DNA and enzymes. Some of the research on these antagonists has focused on cannabinoids, a subset of which have been found to be NMDA receptor antagonists. U.S. Pat. No. 5,538,993 (3S,4S-delta-6-tetrahydrocannabinol-7-oic acids), U.S. Pat. No. 5,521,215 (sterospecific (+) THC enantiomers), and U.S. Pat. No. 5,284,867 (dimethylheptyl benzopyrans) have reported that these cannabinoids are effective NMDA receptor blockers. U.S. Pat. No. 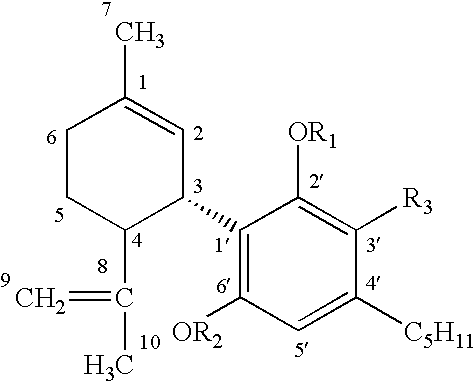 5,434,295 discloses that the 1,1 dimethylheptyl (DMH) homolog of [3R,4R]-7-hydroxy-Δ6THC (known as HU-210) is a superpotent cannabinoid receptor agonist with cannabinomimetic activity two orders of magnitude greater than the natural Δ9 THC. The HU-210 dimethylheptyl cannabinoid, has severe side effects, including fatigue, thirst, headache, and hypotension. J. Pharmacol. Sci. 60:1433-1457 (1971). Subjects who received this synthetic cannabinoid with a dimethylheptyl group experienced marked psychomotor retardation, and were unwilling or incapable of assuming an erect position. In contrast to HU-210, the (−)(3R,4R) THC-DMH enantiomer (known as HU-211) displays low affinity to the cannabinoid receptors, but retains NMDA receptor antagonist neuroprotective activity. THC (tetrahydrocannabinol) is another of the cannabinoids that has been shown to be neuroprotective in cell cultures, but this protection was believed to be mediated by interaction at the cannabinoid receptor, and so would be accompanied by undesired psychotropic side effects. Although it has been unclear whether cannabimimetic activity plays a role in neuroprotection against glutamate induced neurological injury, the teaching in this field has clearly been that a cannabinoid must at least be an antagonist at the NMDA receptor to have neuroprotective effect. 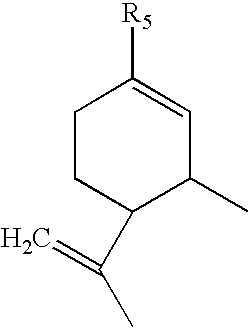 Hence cannabidiol (2-[3-methyl-6-(1-methylethenyl)-2-cyclohexen-1-yl]-5-pentyl-1,3-benzenediol or CBD), a cannabinoid devoid of psychoactive effect (Pharm. Rev. 38:21-43, 1986), has not been considered useful as a neuroprotectant. Cannabidiol has been studied as an antiepileptic (Carlini et al., J. Clin. Pharmacol. 21:417S-427S, 1981; Karler et al., J. Clin. Pharmacol. 21:437S-448S, 1981, Consroe et al., J. Clin Phannacol. 21:428S-436S, 1981), and has been found to lower intraocular pressure (Colasanti et al, Exp. Eye Res. 39:251-259, 1984 and Gen. Pharmac. 15:479-484, 1984). It has surprisingly been found that cannabidiol and other cannabinoids can function as neuroprotectants, even though they lack NMDA receptor antagonist activity. This discovery was made possible because of the inventor's recognition of a previously unanticipated antioxidant property of the cannabinoids in general (and cannabidiol in particular) that functions completely independently of antagonism at the NMDA, AMPA and kainate receptors. Hence the present invention includes methods of preventing or treating diseases caused by oxidative stress, such as neuronal hypoxia, by administering a prophylactic or therapeutically effective amount of a cannabinoid to a subject who has a disease caused by oxidative stress. 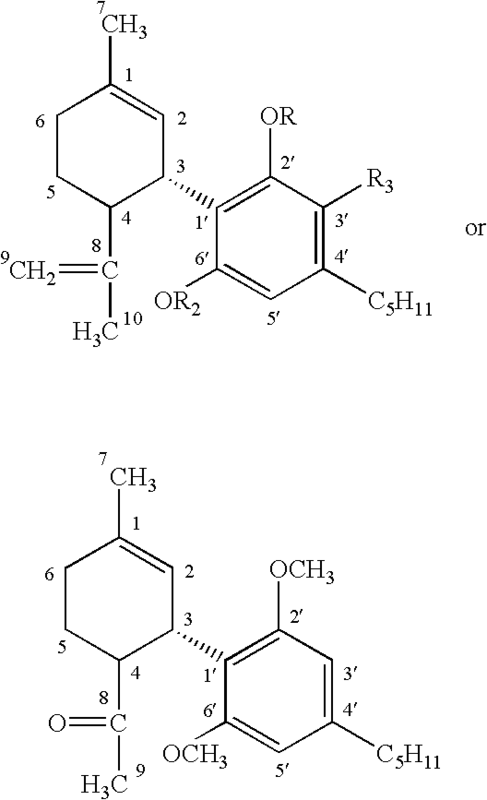 and the R1-R5 groups are each independently selected from the groups of hydrogen, lower substituted or unsubstituted alkyl, substituted or unsubstituted carboxyl, substituted or unsubstituted alkoxy, substituted or unsubstituted alcohol, and substituted or unsubstituted ethers, and R6-R7 are H or methyl. In particular embodiments, there are no nitrogens in the rings, and/or no amino substitutions on the rings. where there can be 0 to 3 double bonds on the A ring, as indicated by the optional double bonds indicated by dashed lines on the A ring. 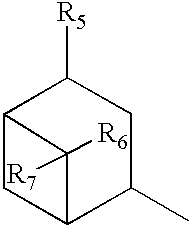 The C ring is aromatic, and the B ring can be a pyran. Particular embodiments are dibenzo pyrans and cyclohexenyl benzenediols. Particular embodiments of the cannabinoids of the present invention may also be highly lipid soluble, and in particular embodiments can be dissolved in an aqueous solution only sparingly (for example 10 mg/ml or less). The octanol/water partition ratio at neutral pH in useful embodiments is 5000 or greater, for example 6000 or greater. This high lipid solubility enhances penetration of the drug into the CNS, as reflected by its volume of distribution (Vd) of 1.5 L/kg or more, for example 3.5 L/kg, 7 L/kg, or ideally 10 L/kg or more, for example at least 20 L/kg. Particular embodiments may also be highly water soluble derivatives that are able to penetrate the CNS, for example carboxyl derivatives. 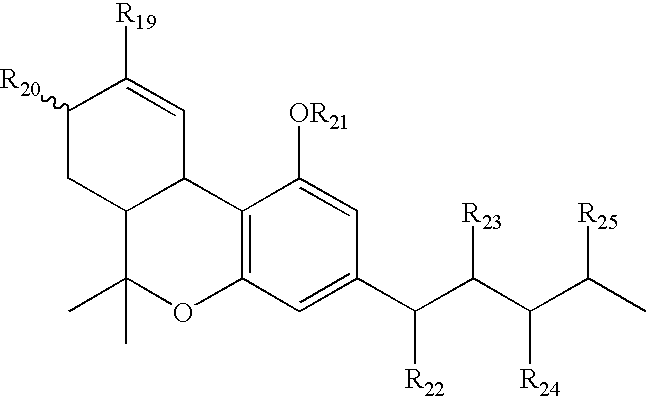 R7-18 are independently selected from the group of H, substituted or unsubstituted alkyl, especially lower alkyl, for example unsubstituted C1-C3 alkyl, hydroxyl, alkoxy, especially lower alkoxy such as methoxy or ethoxy, substituted or unsubstituted alcohol, and unsubstituted or substituted carboxyl, for example COOH or COCH3. In other embodiments R7-18 can also be substituted or unsubstituted amino, and halogen. The cannabinoid has substantially no binding to the NMDAr (for example an IC50 greater than or equal to 5 μM or 10 μM), has substantially no psychoactive activity mediated by the cannabinoid receptor (for example an IC50 at the cannabinoid receptor of greater than or equal to 300 nM, for example greater than 1 μM and a Ki greater than 250 nM, especially 500-1000 nM, for example greater than 1000 nM), and antioxidant activity, as demonstratable by the Fenton reaction or cyclic voltametry. where R19 is substituted or unsubstituted alkyl, such as lower alkyl (for example methyl), lower alcohol (such as methyl alcohol) or carboxyl (such as carboxylic acid) and oxygen (as in ═O); R20 is hydrogen or hydroxy; R21 is hydrogen, hydroxy, or methoxy; R22 is hydrogen or hydroxy; R23 is hydrogen or hydroxy; R24 is hydrogen or hydroxy; R25 is hydrogen or hydroxy; and R26 is substituted or unsubstituted alkyl (for example n-methyl alkyl), substituted or unsubstituted alcohol, or substituted or unsubstituted carboxy. When R27=R28=R29=H, then the compound is cannabidiol. When R27=R29=H and R28=CH3, the compound is CBD monomethyl ether. When R27=R28=CH3 and R29=H, the compound is CBD dimethyl ether. 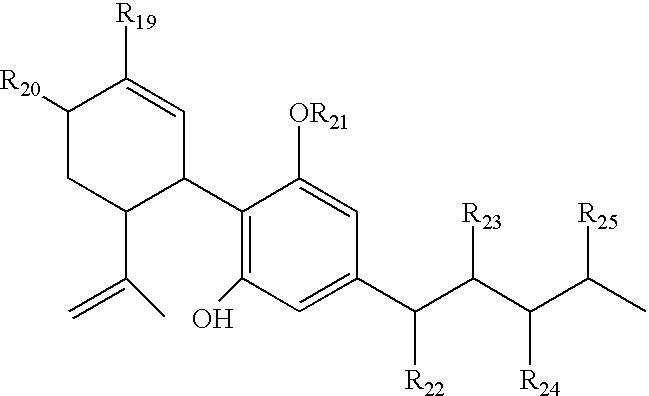 When R27=R28=COCH3 and R29=H, the compound is CBD diacetate. When R27=H and R28=R29=COCH3, the compound is CBD monoacetate. The ischemic or neurodegenerative disease may be, for example, an ischemic infarct, Alzheimer's disease, Parkinson's disease, Down's syndrome, human immunodeficiency virus (HIV) dementia, myocardial infarction, or treatment and prevention of intraoperative or perioperative hypoxic insults that can leave persistent neurological deficits following open heart surgery requiring heart/lung bypass machines, such as coronary artery bypass grafts (CABG). FIG. 2A is a bar graph showing cellular damage (as measured by LDH release) in the presence of glutamate alone (100 μM Glu), and in the presence of glutamate and 5 μM cannabidiol (CBD) or 5 μM THC, and demonstrates that CBD and THC were similarly protective. FIG. 2B is a bar graph similar to FIG. 2A, but showing the cellular damage assessed in the presence of the cannabinoid receptor antagonist SR 141716A (SR), which was not found to alter the neuroprotective effect of CBD (5 μM) or THC (5 μM), indicating the effect is not a typical cannabinoid effect mediated by the cannabinoid receptor. Free radicals are atoms, ions or molecules that contain an unpaired electron, are usually unstable, and exhibit short half-lives. Reactive oxygen species (ROS) is a collective term, designating the oxygen radicals (e.g. .O2 − superoxide radical), which by sequential univalent reduction produces hydrogen peroxide (H2O2) and hydroxyl radical (.OH). The hydroxyl radical sets off chain reactions and can interact with nucleic acids. Other ROS include nitric oxide (NO.) and peroxy nitrite (NOO. 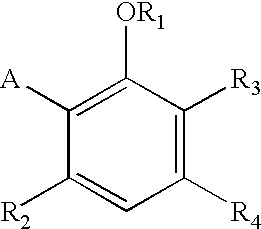 ), and other peroxyl (RO2.) and alkoxyl (RO.) radicals. Increased production of these poisonous metabolites in certain pathological conditions is believed to cause cellular damage through the action of the highly reactive molecules on proteins, lipids and DNA. In particular, ROS are believed to accumulate when tissues are subjected to ischemia, particularly when followed by reperfusion. The pharmaceutical compositions of the present invention have potent antioxidant and/or free radical scavenging properties, that prevent or reduce oxidative damage in biological systems, such as occurs in ischemic/reperfusion injury, or in chronic neurodegenerative diseases such as Alzheimer's disease, HIV dementia, and many other oxidation associated diseases. Oxidative associated diseases include, without limitation, free radical associated diseases, such as ischemia, ischemic reperfusion injury, inflammatory diseases, systemic lupus erythematosis, myocardial ischemia or infarction, cerebrovascular accidents (such as a thromboembolic or hemorrhagic stroke) that can lead to ischemia or an infarct in the brain, operative ischemia, traumatic hemorrhage (for example a hypovolemic stroke that can lead to CNS hypoxia or anoxia), spinal cord trauma, Down's syndrome, Crohn's disease, autoimmune diseases (e.g. rheumatoid arthritis or diabetes), cataract formation, uveitis, emphysema, gastric ulcers, oxygen toxicity, neoplasia, undesired cellular apoptosis, radiation sickness, and others. The present invention is believed to be particularly beneficial in the treatment of oxidative associated diseases of the CNS, because of the ability of the cannabinoids to cross the blood brain barrier and exert their antioxidant effects in the brain. In particular embodiments, the pharmaceutical composition of the present invention is used for preventing, arresting, or treating neurological damage in Parkinson's disease, Alzheimer's disease and HIV dementia; autoimmune neurodegeneration of the type that can occur in encephalitis, and hypoxic or anoxic neuronal damage that can result from apnea, respiratory arrest or cardiac arrest, and anoxia caused by drowning, brain surgery or trauma (such as concussion or spinal cord shock). As used herein, an “antioxidant” is a substance that, when present in a mixture containing an oxidizable substrate biological molecule, significantly delays or prevents oxidation of the substrate biological molecule. Antioxidants can act by scavenging biologically important reactive free radicals or other reactive oxygen species (.O2 −, H2O2, .OH, HOCl, ferryl, peroxyl, peroxynitrite, and alkoxyl), or by preventing their formation, or by catalytically converting the free radical or other reactive oxygen species to a less reactive species. Relative antioxidant activity can be measured by cyclic voltametry studies of the type disclosed in Example 5 (and FIG. 3), where the voltage (x-axis) is an index of relative antioxidant activity. The voltage at which the first peak occurs is an indication of the voltage at which an electron is donated, which in turn is an index of antioxidant activity. As used herein, a “cannabinoid” is a chemical compound (such as cannabinol, THC or cannabidiol) that is found in the plant species Cannabis saliva (marijuana), and metabolites and synthetic analogues thereof that may or may not have psychoactive properties. Cannabinoids therefore include (without limitation) compounds (such as THC) that have high affinity for the cannabinoid receptor (for example Ki<250 nM), and compounds that do not have significant affinity for the cannabinoid receptor (such as cannabidiol, CBD). 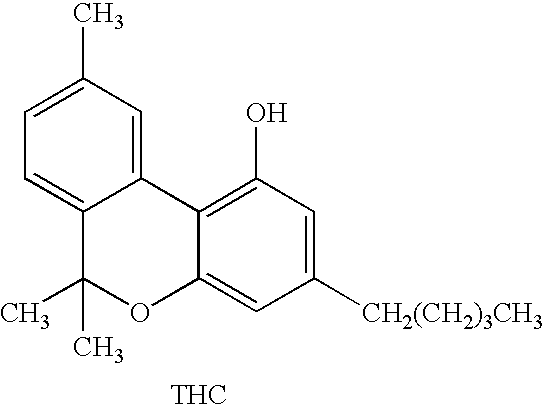 Cannabinoids also include compounds that have a characteristic dibenzopyran ring structure (of the type seen in THC) and cannabinoids which do not possess a pyran ring (such as cannabidiol). Hence a partial list of cannabinoids includes THC, CBD, dimethyl heptylpentyl cannabidiol (DMHP-CBD), 6,12-dihydro-6-hydroxy-cannabidiol (described in U.S. Pat. No. 5,227,537, incorporated by reference); (3S,4R)-7-hydroxy-Δ6-tetrahydrocannabinol homologs and derivatives described in U.S. Pat. No. 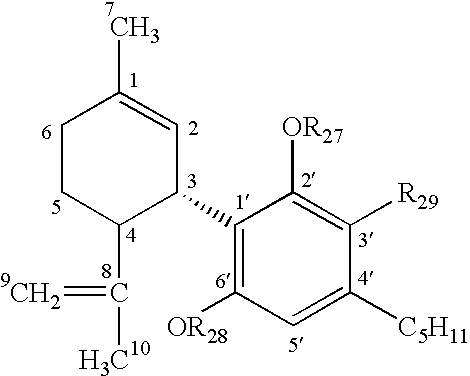 4,876,276, incorporated by reference; (+)-4-[4-DMH-2,6-diacetoxy-phenyl]-2-carboxy-6,6-dimethylbicyclo[3.1.1]hept-2-en, and other 4-phenylpinene derivatives disclosed in U.S. Pat. No. 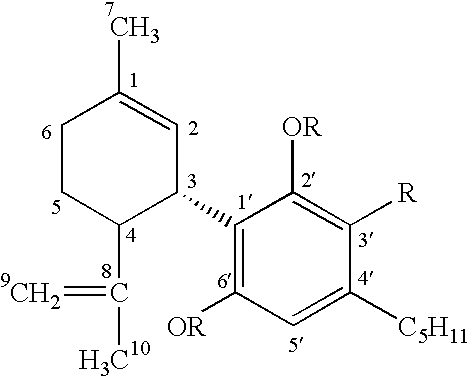 5,434,295, which is incorporated by reference; and cannabidiol (−)(CBD) analogs such as (−)CBD-monomethylether, (−)CBD dimethyl ether; (−)CBD diacetate; (−)3′-acetyl-CBD monoacetate; and ±AF11, all of which are disclosed in Consroe et al., J. Clin. Phannacol. 21:428S-436S, 1981, which is also incorporated by reference. Many other cannabinoids are similarly disclosed in Agurell et al., Pharmacol. Rev. 38:31-43, 1986, which is also incorporated by reference. “Alcohol” refers to R—OH, wherein R is alkyl, especially lower alkyl (for example in methyl, ethyl or propyl alcohol). An alcohol may be either linear or branched, such as isopropyl alcohol. “Carboxyl” refers to the radical —COOH, and substituted carboxyl refers to —COR where R is alkyl, lower alkyl or a carboxylic acid or ester. The term “alkoxy” refers to a substituted or unsubstituted alkoxy, where an alkoxy has the structure —O—R, where R is substituted or unsubstituted alkyl. In an unsubstituted alkoxy, the R is an unsubstituted alkyl. The term “substituted alkoxy” refers to a group having the structure —O—R, where R is alkyl which is substituted with a non-interfering substituent. The term “arylalkoxy” refers to a group having the structure —O—R—Ar, where R is alkyl and Ar is an aromatic substituent. Arylalkoxys are a subset of substituted alkoxys. Examples of useful substituted alkoxy groups are: benzyloxy, naphthyloxy, and chlorobenzyloxy. The term “aryloxy” refers to a group having the structure —O—Ar, where Ar is an aromatic group. A particular aryloxy group is phenoxy. “Arylalkyl” refers to the groups —R—Ar and —R—HetAr, where Ar is an aryl group. HetAr is a heteroaryl group, and R is a straight-chain or branched chain aliphatic group. Example of arylaklyl groups include benzyl and furfuryl. Arylalkyl groups can optionally be unsubstituted or substituted with, e.g., halogen, alkyl, alkoxy, alkylthio, trifluoromethyl, acyloxy, hydroxy, mercapto, carboxy, aryloxy, aryl, arylalkyl, heteroaryl, amino, alkylamino, dialkylamino, morpholino, peperidino, pyrrolidin-1-yl, piperazin-1-yl, or other functionality. The term “amino” refers to a chemical functionality —NR′R″ where R′ and R″ are independently hydrogen, alkyl, or aryl. The term “quaternary amine” refers to the positively charged group —N+R′R″, where R′R″ and R″ are independently selected and are alkyl or aryl. A particular amino group is —NH2. All chemical compounds include both the (+) and (−) stereoisomers, as well as either the (+) or (−) stereoisomer. Primary neuronal cultures were prepared according to the method of Ventra et al. (J. Neurochem. 66:1752-1761, 1996). Fetuses were extracted by Cesarian section from a 17 day pregnant Wistar rat, and the feral brains were placed into phosphate buffered saline. The cortices were then dissected out, cut into small pieces and incubated with papain for nine minutes at 37° C. After this time the tissue was dissociated by passage through a fire polished Pasteur pipette, and the resultant cell suspension separated by centrifugation over a gradient consisting of 10 mg/ml bovine serum albumin and 10 mg/ml ovomucoid (a trypsin inhibitor) in Earls buffered salt solution. The pellet was then re-suspended in high glucose, phenol red free Dulbeco's modified Eagles medium containing 10% fetal bovine serum, 2 mM glutamine, 100 IU penicillin, and 100 μg/ml streptomycin (DMEM). Cells were counted, tested for vitality using the trypan blue exclusion test and seeded onto poly-D-lysine coated 24 multiwell plates. After 96 hours, 10 μM fluoro-deoxyuridine and 10 μM uridine were added to block glial cell growth. This protocol resulted in a highly neuron-enriched culture. Astrocyte conditioned DMEM was used throughout the AMPA/kainate toxicity procedure and following glutamate exposure in the NMDAr mediated toxicity protocol. Media was conditioned by 24 hour treatment over a confluent layer of type I astrocytes, prepared from two day old Wistar rat pups. Cortices were dissected, cut into small pieces, and enzymatically digested with 0.25% trypsin. Tissue was then dissociated by passage through a fire polished Pasteur pipette and the cell suspension plated into untreated 75 cm2 T-flasks. After 24 hours the media was replaced and unattached cells removed. Once astrocytes achieved confluence, cells were divided into four flasks. Media for experiments was conditioned by a 24 hour exposure to these astrocytes, after which time it was frozen at −20° C. until use. Astrocyte cultures were used to condition DMEM for no longer than two months. Glutamate neurotoxicity can be mediated by NMDA, AMPA or kainate receptors. To examine NMDAr mediated toxicity, cultured neurons (cultured for 14-18 days) were exposed to 250 μM glutamate for 10 minutes in a magnesium free saline solution. The saline was composed of 125 mM NaCl, 25 mM glucose, 10 mM HEPES (pH 7.4), 5 mM KCl, 1.8 mM calcium chloride and 5% bovine serum albumin. Following exposure, cells were washed twice with saline, and incubated for 18 hours in conditioned DMEM. The level of lactate dehydrogenase (LDH) in the media was used as an index of cell injury. Toxicity was completely prevented by addition of the NMDAr antagonist, MK-801 (500 nM, data not shown). However, FIG. 1A shows that cannabidiol also prevented neurotoxicity (maximum protection 88±9%) with an EC50 of 2-4 μM (specifically about 3.5 μM). Unlike NMDA receptors, which are regulated by magnesium ions, AMPA/kainate receptors rapidly desensitize following ligand binding. To examine AMPA and kainate receptor mediated toxicity, neurons were cultured for 7-13 days, then exposed to 100 μM glutamate and 50 μM cyclothiazide (used to prevent AMPA receptor desensitization). Cells were incubated with glutamate in the presence of 500 nM MK-801 (an NMDAr antagonist) for 18-20 hours prior to analysis. Specific AMPA and kainate receptor ligands were also used to separately examine the effects of cannabinoids on AMPA and kainate receptor mediated events. Fluorowillardiine (1.5 μM) was the AMPA agonist and 4-methyl glutamate (10 μM) was the kainate agonist used to investigate receptor mediated toxicity. When specifically examining kainate receptor activity, cyclothiazide was replaced with 0.15 mg/ml Concanavalin-A. Cannabidiol protection against AMPA/kainate mediated neurotoxicity is illustrated in FIG. 1B, where LDH in the media was used as an index of cell injury. The neuroprotective effect of cannabidiol was similar to that observed in the NMDA mediated toxicity model (FIG. 1A). Cannabidiol prevented neurotoxicity (maximum protection 80±17%) with an EC50 of 2-4 μM (specifically about 3.3 μM). Comparable results were obtained with either the AMPA receptor ligand, fluorowillardiine or the kainate receptor specific ligand, 4-methyl-glutamate (data not shown). Hence cannabidiol protects similarly against toxicity mediated by NMDA, AMPA or kainate receptors. 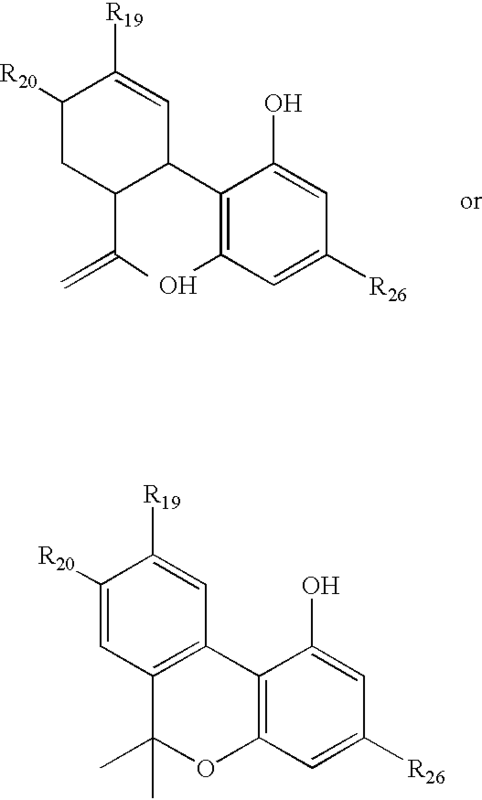 The ability of cannabinoids to be readily oxidized, as illustrated in Example 5, indicated they possess antioxidant properties comparable to BHT. The antioxidant activity of BHT was examined in a Fenton reaction, in which iron is catalyzed to produce ROS. 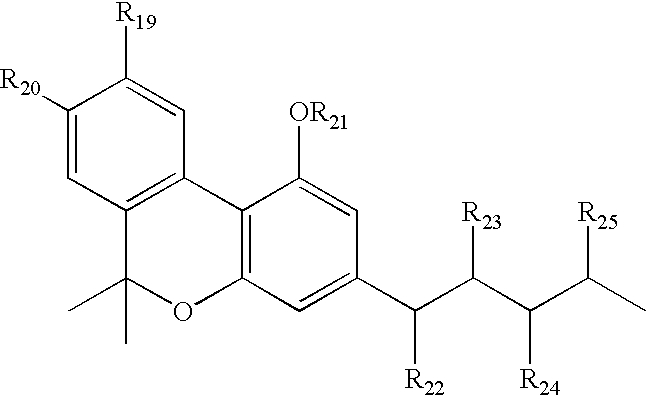 Cannabidiol (CBD) and tetrahydrocannabinol (THC) were evaluated for their ability to prevent oxidation of dihydrorhodamine to the fluorescent compound rhodamine. Oxidant was generated by ferrous catalysis (diothionite reduced ferric citrate) of t-butyl hydroperoxide in a 50:50 water:acetonitrile (v/v) solution. Dihydrorhodamine (50 μM) was incubated with 300 μM t-butyl hydroperoxide and 0.5 μM iron for 5 minutes. After this time, oxidation was assessed by spectrofluorimetry (Excit=500 nm, Emiss=570 nm). Various concentrations of cannabinoids and BHT were included to examine their ability to prevent dihydrorhodiamine oxidation. To confirm that cannabinoids act as antioxidants in the intact cell, neurons were also incubated with the oxidant t-butyl hydroperoxide and varying concentrations of cannabidiol (FIG. 5A). The t-butyl hydroperoxide oxidant was chosen for its solubility in both aqueous and organic solvents, which facilitates oxidation in both cytosolic and membrane cell compartments. Cell toxicity was assessed 18-20 hours after insult by measuring lactate dehydrogenase (LDH) release into the culture media. All experiments were conducted with triple or quadruple values at each point and all plates contained positive (glutamate alone) and baseline controls. The assay was validated by comparison with an XTT based metabolic activity assay. As shown in FIG. 5A, cannabidiol protected neurons against ROS toxicity in a dose related manner, with an EC50 of about 6 μM. The maximum protection observed was 88±9%. Cannabidiol was also compared with known antioxidants in an AMPA/kainate toxicity protocol. Neurons were exposed to 100 μM glutamate and equimolar (5 μM) cannabidiol, α-tocopherol, BHT or ascorbate (FIG. 5B). Although all of the antioxidants attenuated glutamate toxicity, cannabidiol was significantly more protective than either α-tocopherol or ascorbate. 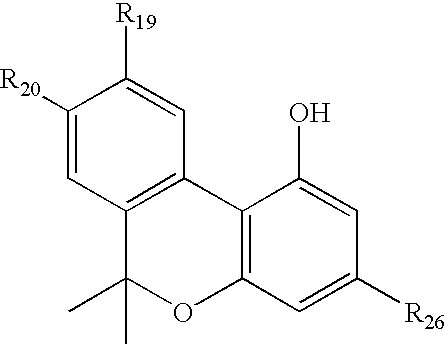 The similar antioxidant abilities of cannabidiol and BHT in this chemical system (FIG. 4), and their comparable protection in neuronal cultures (FIG. 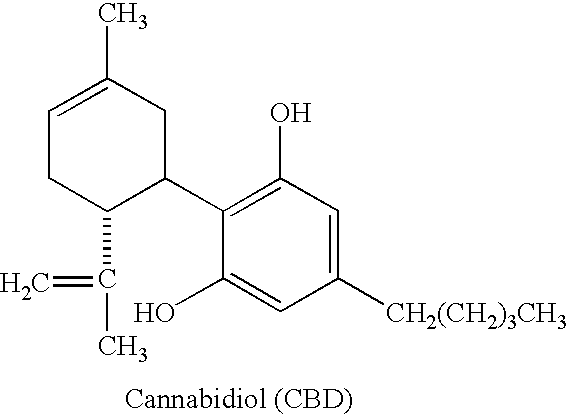 5B), implies that cannabidiol neuroprotection is due to an antioxidant effect. Cannabinoids that lack psychoactivity or psychotoxicity are particularly useful embodiments of the present invention, because the absence of such side effects allows very high doses of the drug to be used without encountering unpleasant side effects (such as dysphoria) or dangerous complications (such as obtundation in a patient who may already have an altered mental status). For example, therapeutic antioxidant blood levels of cannabidiol can be 5-20 mg/kg, without significant toxicity, while blood levels of psychoactive cannabinoids at this level would produce obtundation, headache, conjunctival irritation, and other problems. Particular examples of the compounds of the present invention have low affinity to the cannabinoid receptor, for example a Ki of greater than 250 nM, for example Ki≧500-1000 nM. A compound with a Ki≧1000 nM is particularly useful, which compound has essentially no psychoactivity mediated by the cannabinoid receptor. In the AMPA/kainate receptor dependent neurotoxicity model, cannabidiol neuroprotection was comparable to the potent antioxidant, BHT, but significantly greater than that observed with either α-tocopherol or ascorbate. This unexpected superior antioxidant activity (in the absence of BHT tumor promoting activity) shows for the first time that cannabidiol, and other cannabinoids, can be used as antioxidant drugs in the treatment (including prophylaxis) of oxidation associated diseases, and is particularly useful as a neuroprotectant. The therapeutic potential of nonpsychoactive cannabinoids is particularly promising, because of the absence of psychotoxicity, and the ability to administer higher doses than with psychotropic cannabinoids, such as THC. Previous studies have also indicated that cannabidiol is not toxic, even when chronically administered to humans or given in large acute doses (700 mg/day). The ability of CBD to inhibit lipoxygenase was examined by measuring the time dependent change in absorption at 234 nM following addition of 5 U of each lipoxygenase (rabbit 15-LO purchased from Biomol (PA), porcine 12-LO purchased from Cayman chemicals (MI)) to a solution containing 10 μM (final concentration) linoleic acid. Enzyme studies were performed using a u.v. spectrophotometer and a 3 ml quartz cuvette containing 2.5 ml of a stirred solution of 12.5 μM sodium linoleic acid (sodium salt) in solution A (25 mM Tris (pH 8.1), 1 mM EDTA 0.1% methyl cellulose). The reaction was initiated by addition of 0.5 ml enzyme solution (10 U/ml enzyme in solution A) and recorded for 60 seconds. Lipoxygenase exhibits non-Michaelis-Menten kinetics, an initial “lag” (priming) phase followed by a linear phase which is terminated by product inhibition. These complications were reduced by assessing enzyme activity (change in absorption) over the “steepest” 20 second period in a 60 second run time. Recordings examined the absorption at 234 nm minus the value at a reference wavelength of 280 nm. Linoleic acid was used as the substrate rather than arachidonic acid, because the products are less inhibitory to the enzyme, thereby providing a longer “linear phase”. Cell pellets were triturated in DMEM culture media, aliquoted and pre-incubated for 15 minutes with 20 μM arachidonic acid and varying concentrations of cannabidiol and/or 40 μM nordihydroguaiaretic acid (a lipxygenase inhibitor). Platelets and leukocytes were also pre-incubated with 80 μM manoalide (Biomol) to prevent phospholipase A2 activation. Product formation was initiated by addition of 5 μM A23187 and incubation for 10 minutes at 37° C. At the end of the incubation, the reaction was stopped by addition of 15% 1M HCl and 10 ng/ml prostaglandin B2 (internal standard). Lipids were extracted with 1 volume of ethyl ether, which was dried under a stream of nitrogen. Samples were reconstituted in 50% acetonitrile:50% H2O and separated by reverse phase HPLC using a gradient running from 63% acetonitrile: 37% H2O:0.2% acetic acid to 90% acetonitrile (0.2% acetic acid) over 13 minutes. The ability of 12-HETE (12-(s)-hydroxy-eicosatetraenoic acid, the product of the action of 12-lipoxygenase on arachidonic (eicosatetraenoic) acid) to protect cortical neurons from NMDAr toxicity was measured as described in Example 3. The 12-HETE (0.5 μg/ml) was added either during ischemia (co-incubated with the glutamate), during post-ischemia (co-incubated with the DMEM after washing the cells), or during both ischemia and post-ischemia. 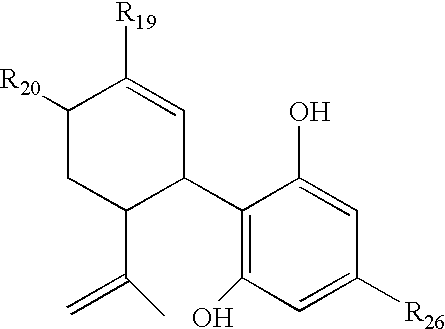 Using semi-purified enzyme preparations, the effect of CBD on rabbit 15-LO and porcine 12-LO was compared. As shown in FIGS. 6A and B, CBD is a potent competitive inhibitor of 15-LO with an EC50 of 598 nM. However, CBD had no effect on the 12-LO enzyme. Using whole cell preparations, the effect of CBD on 5- and 12-LO enzymes was investigated. As shown in FIG. 7A, CBD inhibited 5-LO in cultured rat basophillic leukemia cells (RBL-2H3) with an EC50 of 1.92 μM. However, CBD had no effect on 12-LO, as monitored by the production of 12-HETE (the product of 12-LO), in either human leukocytes or platelets (FIGS. 7B and C). The leukocyte 12-LO is similar, while the platelet 12-LO is structurally and functionally different, from the porcine 12-LO used in the in vitro enzyme study. Given the excellent absorption of the compounds of the present invention via an inhaled route, the compounds may also be administered as inhalants, for example in pharmaceutical aerosols utilizing solutions, suspensions, emulsions, powders and semisolid preparations of the type more fully described in Remington: The Science and Practice of Pharmacy (19th Edition, 1995) in chapter 95. A particular inhalant form is a metered dose inhalant containing the active ingredient, in a suspension or a dispersing agent (such as sorbitan trioleate, oleyl alcohol, oleic acid, or lecithin, and a propellant such as 12/11 or 12/114). Note: R-group substituents are H if not indicated otherwise. 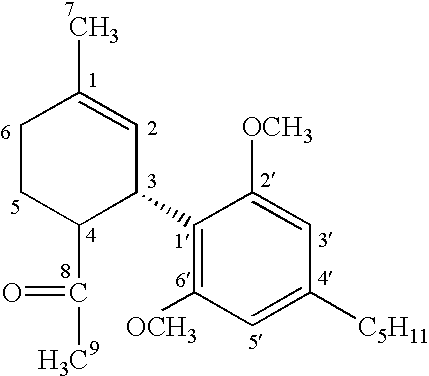 Chemical structures of some of the dibenzopyran cannabinoids are shown below. R5 is H, hydroxyl, or lower substituted or unsubstituted alkyl. R5 is hydroxyl or methyl. where R1, R2 and R3 are independently H, CH3, or COCH3. where R19 is H, lower alkyl, lower alcohol, or carboxyl; R20 is H or OH; and R21-R25 are independently H or OH. 12. The method of claim 11, wherein R19 is H, CH3, CH2OH, or COOH, and R20-R24 are independently H or OH. where R19 and R20 are H, and R26 is alkyl. 17. The method of claim 15 where the ischemic or neurodegenerative disease is an ischemic infarct, Alzheimer's disease, Parkinson's disease, and human immunodeficiency virus dementia, Down's syndrome, or heart disease. 24. The method of claim 22, wherein the ischemic or neurodegenerative disease is an ischemic infarct, Alzheimer's disease, Parkinson's disease, and human immunodeficiency virus dementia, Down's syndrome, or heart disease. Agurell et al., "Pharmacokinetics and Metabolism of Delta<1>-Tetrahydrocannabinol and Other Cannabinoids with Emphasis on Man*," Pharmacological Reviews, 38(1):21-43 (1986). Agurell et al., "Pharmacokinetics and Metabolism of Δ1-Tetrahydrocannabinol and Other Cannabinoids with Emphasis on Man*," Pharmacological Reviews, 38(1):21-43 (1986). Alonso et al., "Simple Synthesis of 5-Substituted Resorcinols: A Revisited Family of Interesting Bioactive Molecules," J. Org. Chem., American Chemical Society, 62(2):417-421 (1997). Carlini et al., "Hypnotic and Antielpileptic Effects of Cannabidiol," J. Clin. Pharmacol., 21:417S-427S (1981). Choi, "Glutamate Neurotoxicity and Diseases of the Nervous System," Neuron, Cell Press, 1:623-634 (1988). Colasanti et al., "Intraocular Pressure, Ocular Toxicity and Neurotoxicity after Administration of Cannabinol or Cannabigerol," Exp. Eye Res., Academic Press Inc., 39:251-259 (1984). Colasanti et al., "Ocular Hypotension, Ocular Toxicity,a nd Neurotoxicity in Response to Marihuana Extract and Cannabidiol," Gen Pharm., Pergamon Press Ltd., 15(6):479-484 (1984). Combes et al. "A Simple Synthesis of the Natural 2,5-Dialkylresorcinol Free Radical Scavenger Antioxidant: Resorstation," Synthetic Communications, Marcel Dekker, Inc., 27(21):3769-3778 (1997). Consroe et al., "Acute and Chronic Antiepileptic Drug Effects in Audiogenic Seizure-Susceptible Rats," Experimental Neurology, Academic Press Inc., 70:626-637 (1980). Consroe et al., "Antiepileptic Potential of Cannabidiol Analgos," J. Clin. Pharmacol., 21:428S-436S (1981). Cunha et al., "Chronic Administration of Cannabidiol to Healthy Volunteers and Epileptic Patients<1>," Pharmacology, 21:175-185 (1980). Cunha et al., "Chronic Administration of Cannabidiol to Healthy Volunteers and Epileptic Patients1," Pharmacology, 21:175-185 (1980). Eshhar et al., "Neuroprotective and Antioxidant Activities of HU-211, A Novel NMDA Receptor Antagonist," European Journal of Pharmacology, 283:19-29 (1995). Hampson et al., "Cannabidiol and (-)Delta<9>-tetrahydrocannabiono are Neuroprotective Antioxidants," Medical Sciences, Proc. Natl. Acad. Sci. USA, 8268-8273 (1998). Hampson et al., "Dual Effects of Anandamide on NMDA Receptor-Mediated Responses and Neurotransmission," Journal of Neurochemistry, Lippincott-Raven Publishers, 70(2):671-676 (1998). Hampson et al., "Cannabidiol and (−)Δ9-tetrahydrocannabiono are Neuroprotective Antioxidants," Medical Sciences, Proc. Natl. Acad. Sci. USA, 8268-8273 (1998). Karler et al., "Different Cannabinoids Exhibit Different Pharmacological and Toxicological Properties,"NIDA Res. Monogr., 79:96-107 (1987). Karler et al., "The Cannabinoids as Potential Antiepileptics," J. Clin. Pharmacol., 21:437S-448S (1981). 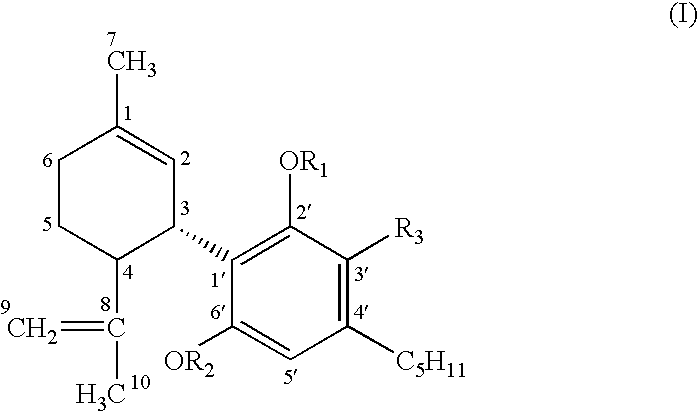 Mechoulam et al., "A Total Synthesis of d1-Delta<1>-Tetrahydrocannabinol, the Active Constituent of Hashish<1>," Journal of the American Chemical Society, 87:14:3273-3275 (1965). Mechoulam et al., "Chemical Basis of Hashish Activity," Science, 18:611-612 (1970). 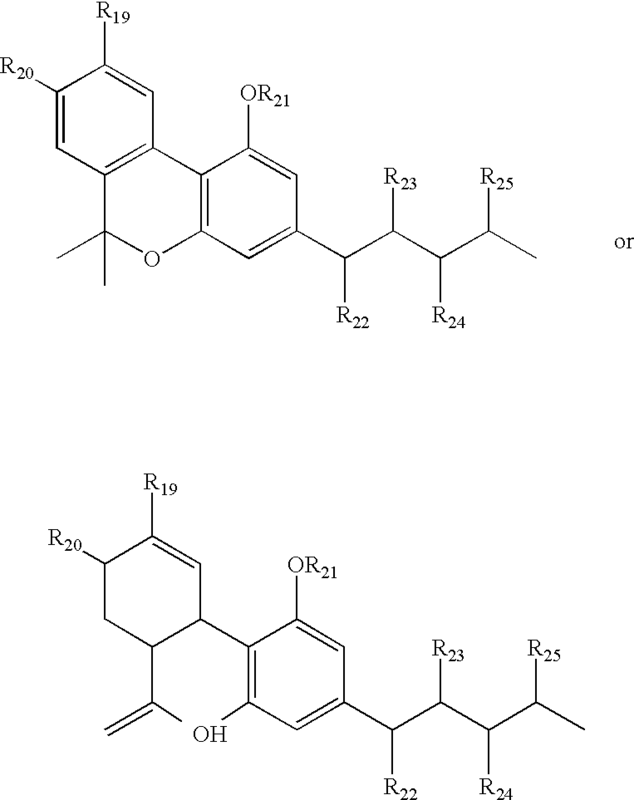 Mechoulam et al., "A Total Synthesis of d1-Δ1-Tetrahydrocannabinol, the Active Constituent of Hashish1," Journal of the American Chemical Society, 87:14:3273-3275 (1965). Ottersen et al., "The Crystal and Molecular Structure of Cannabidiol," Acta Chem. Scand. B 31, 9:807-812 (1977). Samara et al., "Pharmacokinetics of Cannabidiol in Dogs," Drug Metabolism and Disposition, 16(3):469-472 (1988). Shohami et al., "Oxidative Stress in Closed-Head Injury: Brain Antioxidant Capacity as an Indicator of Functional Outcome," Journal of Cerebral Blood Flow and Metabolism, Lippincott-Raven Publishers, 17(10):1007-1019 (1997). Skaper et al., "The ALIAmide Palmitoylethanolamide and Cannabinoids, but not Anandamide, are Protective in a Delayed Postglutamate Paradigm of Excitotoxic Death in Cerebellar Granule Neurons," Neurobiology, Proc. Natl. Acad. Sci. USA, 93:3984-3989 (1996). Turkanis et al., "Electrophysiologic Properties of the Cannabinoids," J. Clin. Pharmacol., 21:449S-463S (1981). Volfe et al., "Cannabinoids Block Release of Serotonin from Platelets Induced by Plasma frm Migraine Patients," Int. J. Clin. Pharm. Res., Bioscience Ediprint Inc., 4:243-246 (1985). Zurier et al., "Dimethylheptyl-THC-11 OIC Acid," Arthritis & Rheumatism, 41(1):163-170 (1998). Howlett et al. 1988 Nonclassical cannabinoid analgetics inhibit adenylate cyclase: development of a cannabinoid receptor model.